Woking-based property advisers, Vail Williams LLP, were the selling agents for one of the biggest property deals to date in the Chertsey area this year. 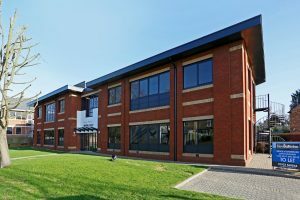 It will see Krome relocate from its offices in Addlestone, to a fully self-contained office building at Kestrel Court, Pound Road, Chertsey – just two miles from its former premises. Situated five minutes’ walk from the town centre, the building, which will soon be renamed Krome House, underwent full refurbishment to create 9,658 sq. ft. of outstanding high-quality office space spread across two floors. Made up of an open plan first floor, together with two separate ground floor wings accessed from a modern reception, the building is ideally situated close to the M25, with good transport links to both Heathrow and London. Steve New, partner at Vail Williams, who marketed the property on behalf of Gardiner Real Estate said: “We’re pleased to have secured the sale of this property to Krome at what is an incredibly buoyant time for the Chertsey office property market. Krome, founded in 2009, recently announced turnover in excess of £15 million for the first time, with profits up 19% on the previous year. Krome, which has contracts in place with a number of enterprise businesses and High Street names, is committed to providing a quality service around all aspects of Information Technology, delivering an enhanced customer and employee experience. A core part of this is the environment in which its employees work. Rupert Mills, Director at Krome discusses: “We moved our Manchester office into new high-quality facilities in Salford Quays last year with great success. This move for our head office in Surrey was the next natural evolution for us. 75 staff from Krome are expected to relocate to the new premises over the next 6 months.